The first day of spring arrived on Wednesday. With spring comes Easter. Churches, nursing homes and businesses in Washington Court House are joining in several Easter celebrations. There will be an Easter Shop Hop on April 12 from 5 p.m. to 8 p.m. It will be hosted by Main Street Fayette in Historic Downtown Washington Court House. Several shops will be taking part during the event, and pictures with the Easter Bunny will be available. See their Facebook event page for more info. Four Seasons of Washington will have an Easter egg hunt on April 13 at 10 a.m. The Easter Bunny will be available for pictures. The egg hunt will be split up for three different age groups: 1-3, 4-6 and 7-9. There will be one golden egg hidden for each age group. The three winners will receive a prize. 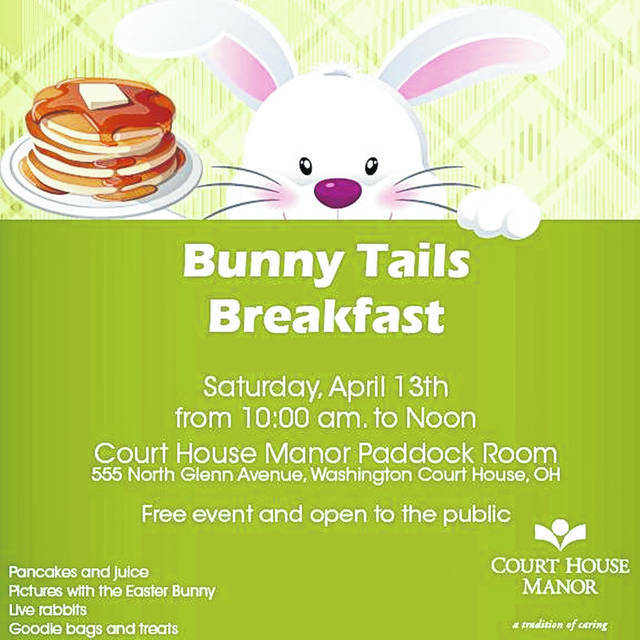 Court House Manor will be hosting Bunny Tails Breakfast on April 13 from 10 a.m. to noon. Along with breakfast, there will be free pictures with the Easter Bunny and real bunnies for kids to enjoy. Carriage Court is hosting an Easter egg hunt on April 13 that starts at 2 p.m. During the hunt, the Easter Bunny will be available for photos. Grace United Methodist Church is partnering with The Well to host a glow-in-the-dark egg hunt on April 13 at 7 p.m. for children in fifth grade and younger. The event will be located at the Washington High School track. On Sunday, April 14 from 10 a.m. to 11 a.m., Grace United Methodist Church will also be hosting, “Walk with Jesus: an Easter Experience.” It is a chance for families (children are welcome) to experience a guide “through Jesus’ last days on earth.” Go to https://wchgrace.com/easter-event/ for more information and to RSVP. On Saturday, April 20, South Side Church of Christ is hosting an Easter egg hunt at 10 a.m. with designated areas for different age groups. The Easter Bunny will be visiting and food will be available. There will be inflatables, including a bounce-house. On April 20 is Eggstravaganza at Heritage Memorial Church. It lasts from 10 a.m. to noon. The egg hunt is for children from walking toddlers through sixth grade. They will have a designated area for children with special needs to enjoy the hunt at their own pace. There will be games and every child receives a free gift. Easter services on Sunday, April 21 are plentiful for those who wish to take part. Heritage Memorial Church is having sunrise service at 7 a.m. and breakfast afterward. Regular services and Sunday school will then meet at 8:45, 10 and 11 a.m.
Grace United Methodist Church is having two services: one at 9 a.m. and one at 11 a.m. Those who attend the services can join in for a potluck breakfast from 10 a.m. to 11 a.m. They ask for attendees to bring one breakfast item or dish to share for the potluck. South Side Church of Christ is having an Easter service at 10:45 a.m.